Arrow Max Compressor & Vacuum Pump is a Bay Area compressed air specialist, serving medical offices, medical professionals, dentists, pharmaceutical companies, medical device companies, and others in the medical field. Whether you are looking for someone to troubleshoot and repair your air compressor setup, or you are interested in installing a new compressed air system, we can help! Serving all makes and models, we have installed & repaired medical air compressors in medical offices, hospitals, dental offices, medical device companies. and more. To schedule repair or learn more about working with Arrow Max to service your medical air compressor needs, please call 510.828.7555 or contact us today. Air compressors run a variety of equipment in the medical field. From hospital systems, to dental chairs, surgical instruments, sterilization and more, compressed air is a vital resources for many in the medical field. Given the stringent requirements for clean air in the medical field, oil free air compressors minimize the chance of contamination and provide breathable air that is safe for patients. 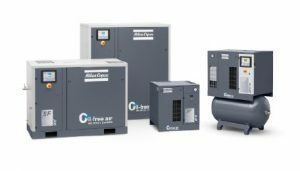 Oil less air compressors come in both reciprocating and scroll, each with their own set of benefits and drawbacks, and talking with the air compressor sales specialists at Arrow Max is the first step towards selecting the right medical air compressor. Not only must air be clean in the medical field, it must also be dry. Why? Moisture becomes an ideal place for microorganisms that can further contaminate the air, a huge problem if patients vulnerable to infection are needlessly exposed. An air dryer setup properly within your compressed air system is the solution. Atlas Copco’s SF oil-free scroll compressors provide 100% oil-free for critical applications in the medical industry. SF compressors eliminate the risks of oil contamination while providing an efficient, reliable and cost-effective source of pure oil-free air. Perfect for medical & dental air compressor applications! Call Arrow Max today at 510.828.7555 or contact us to schedule an appointment for sales or service.